This flying insect Zapper is the ideal solution to those uninvited guests at your next BBQ. It is also ideal for use all round the home, on holiday or camping trips. It comes in the form of a tennis racket which exterminates those annoying flies, mosquitoes, wasps and any other kind of flying insects, without the use of harmful chemicals, making it an extremely environmentally safe product. Simply Hold the handle, and press the on button to initiate power on the mesh nets, a red light will glow in the handle to indicate action. Keep the button pressed whilst ZAPPING Bugs. 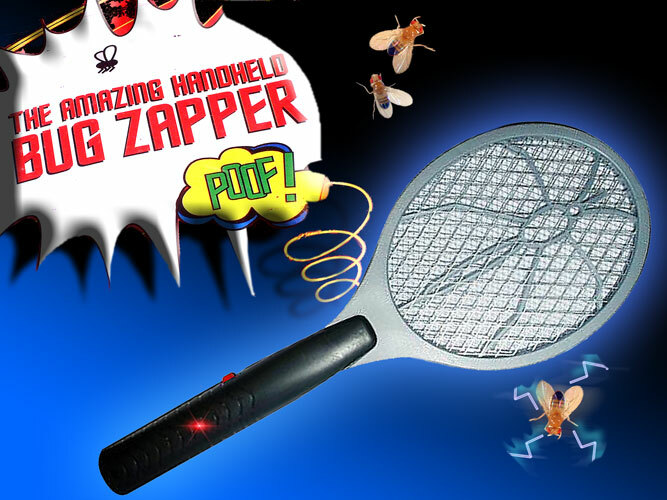 Upon contact with the inner mesh, the annoying bug is zapped with a satisfying blue spark and zapping sound. **SAFETY & CAUTION** THIS IS NOT A TOY FOR CHILDREN !! Please Use only as the instructions direct for adults only.